Scroll down for full fingerstyle guitar lesson (with tab/video tutorial) of Babe I'm Gonna Leave You by Led Zeppelin. 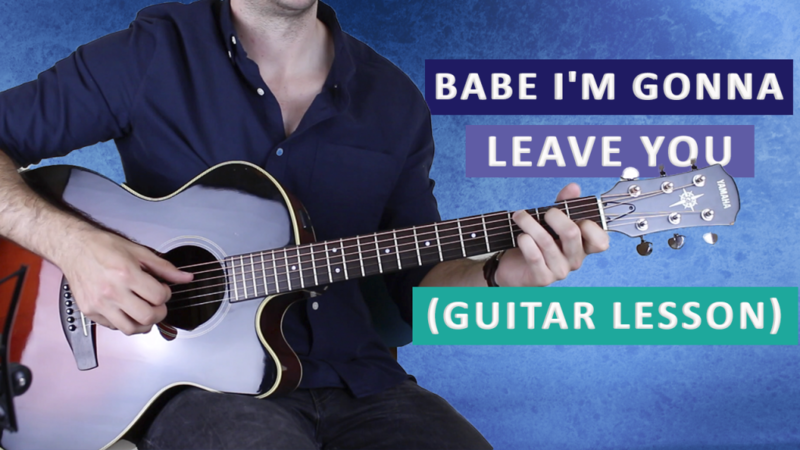 Babe I'm Gonna Leave You was originally written in the late 1950s by a folk singer-songwriter called Anne Johannsen. Joan Baez then covered the song which appears as the opening track on her live album 'Joan Baez in Concert, Part one'. Led Zeppelin then covered the song in 1969 for their self-titled debut album 'Led Zeppelin', and it went on to become one of their best-known songs. Babe I'm Gonna Leave You is no. 44 on my Top 60 Fingerpicking Songs of ALL TIME list. If you've not seen the list be sure to check it out and sign up to my weekly email lesson. That way you won't miss learning any of these great fingerstyle songs. This is a song of epic proportions, and not for the fainthearted to learn from start to finish. It's not that it's really difficult to play the parts, it's all the twists and turns and endless nuances in the picking hand that make it so complicated. You absolutely must listen over and over again to the track as you learn it to make sure you're getting it right. Intro, verse, bridge, verse, bridge, pre-chorus, chorus, bridge, solo (intro progression), verse, chorus, verse, chorus, solo (verse progression), chorus, outro. I recommend really familiarising yourself with the intro progression here, as most of the song is based around these chords. It's entirely up to you whether you play this song with a pick or as fingerstyle. As you can see, the verse chords of Babe I'm Gonna Leave You are the same as the intro chords. However, as you work your way through you'll notice some nuances. One of the easier parts of the song here. This section only appears once in the song, just before the first chorus. Although it only comes up once it's still an integral part of the piece. For the chorus you take the exact same chords that are used in the verse and really dig in and strum the hell out of them! Going into the 2nd verse Page is mixing things up again and arpeggiates the chords differently. As mentioned at the beginning of the lesson, listen to the song to check you're playing it correctly. Finally, after 5 minutes and 50 seconds you arrive at the outro, but you're not out of the woods just yet as Page has another surprise for you.